2 In L’Echo of 6 April 2013. 1“We have not been good enough in mobility matters. The problems are still pronounced. We have not really been able to keep them under control.” This observation by Charles Picqué2 one month before the end of his presidency of the Brussels-Capital Region (BCR) is in keeping with other diagnoses3 and a feeling evoked by the media, which regularly present Brussels as the “European traffic jam capital”.4 This synopsis provides the most complete and detailed overview of mobility in Brussels. 2“Mobility” is a multidimensional concept which has become widespread over the past fifteen years. Most of the time, it is synonymous with “travel” or “movement” in physical space. Even limited to this definition, spatial or geographic mobility is broken down into different temporal scales (daily, weekly, monthly, seasonal, annual, over a lifetime, etc) and spatial scales (local, national, international, etc). Generally, a distinction is made between four main forms of spatial mobility [Kaufmann, 2011] according to whether it concerns short or long temporalities and is situated within an individual’s living area: daily mobility, residential mobility, travel and tourism and migrations. These different forms of mobility have literally exploded during the past decades, to the point of causing a “mobility turn” which now affects all aspects of economic, social and political life [Urry, 2007]. 3This synopsis explores this “mobility turn” with respect to a very well-defined focal point: the daily travel of people in, from and to Brussels. It thus brings up to date the synopsis on the same theme from the Citizens’ Forum of Brussels [Hubert et al., 2009] and adds to it considerably. It also makes use of the data and analyses from the first two Cahiers de l’Observatoire de la mobilité of the Brussels-Capital Region [Lebrun et al., 2012; Lebrun et al., 2013]. 4The first part of the synopsis presents the main challenges which Brussels faces. It then looks at the tools and institutional challenges, before ending with an analysis of the convergences and divergences surrounding two undertakings which many feel are a priority for Brussels: the development of the railway network of the Société des Transports Intercommunaux Bruxellois (STIB) and the operating of the future RER. 5The three major challenges which the Region must face are the population boom and the expansion of activities it favours, the accessibility of the city and the quality of public spaces. They are closely related to the problem of mobility, and the way in which they will be met in coming years will greatly determine the quality of life in the city as well as its attractiveness. 6The fact is well known: since 2000, BCR has experienced significant population growth.5 There were 1 089 538 inhabitants living there in 2010, i.e. 130 220 more than there were ten years before, which represents an increase of 13.6% (1.3% on an annual basis). The growth was such that the Region exceeded its historical maximum from the 1960s [Lebrun et al., 2012: 13]. And there is nothing to indicate that it will slow down in future, as there will be 1.23 million inhabitants the Region in 2020, according to the IBSA [Dehaibe and Laine, 2010]. 7The outskirts of Brussels (figure 1) have not been left out, even if growth has been slower than in the capital. The 33 municipalities which form the first outskirts gained 38 000 inhabitants between 2000 and 2010 (+6.3%), while the 83 municipalities of the second outskirts gained close to 84 000 during the same period (+6.1%). Together, BCR and the first and second outskirts form the area called Iris 2, which is geographically close to the RER area. The metropolitan area, mentioned later in this document, includes BCR as well as Walloon and Flemish Brabant. 7 Only drivers are considered. 8Of course, only some inhabitants from the outskirts (and beyond) go to Brussels regularly, but they have a considerable impact on urban mobility6 and road traffic. Among all road traffic in Brussels on an average day, approximately 40% is created by people who live in Flanders or Wallonia, the remainder being due to residents of Brussels.7 This proportion is considerable given that the majority of travel by non-residents takes place on working days during peak hours and concerns inbound/outbound travel. Although there are generally more cars owned by inhabitants of Brussels in the streets of the capital, this is therefore not the case all the time, given that the modal distribution is very different according to the type of travel considered. Thus, in 2010, almost two thirds of inbound travel in Brussels and outbound travel took place by car, which is twice what is seen for internal traffic in Brussels (table 1). It must also be pointed out that car travel involving inhabitants of Brussels in the capital (i.e. the vast majority of internal traffic) is on average shorter. This involves in particular a lower environmental impact. 9The phenomenon of the daily commute in connection with Brussels emerged during the second half of the 19th century, at a time when industry was flourishing in the city and the excellent railway network allowed workers to go to their place of work easily and live in their village of origin. This was favoured by the political will at the time to avoid urban crowding [Polasky, 2010] and by the creation in 1870 of the inexpensive workers’ rail pass [Dessouroux, 2008: 95]. Beginning in the 1950s, workers were gradually replaced by employee commuters, whose travel practices evolved towards the car (without totally abandoning the train), in connection with the massive investment in road infrastructures. The use of the car led to urban sprawl, in the absence of restrictive regional planning [Dubois, 2005]. 10The population boom and urban sprawl result in an expansion of activities generating travel in Brussels and in its outskirts, be they related to work, education, business or culture. As in many other cities, the internal growth of the Brussels Region, due to extension and densification, was doubled by external growth, through the absorption of cities and villages – which were experiencing growth themselves – in the metropolitan area. This creates a vast metropolis, spread out and intermittent, heterogeneous and multipolar. In this configuration, travel from outskirts to outskirts and from centre to outskirts, in particular, becomes significant and the centralities are modified in certain areas. 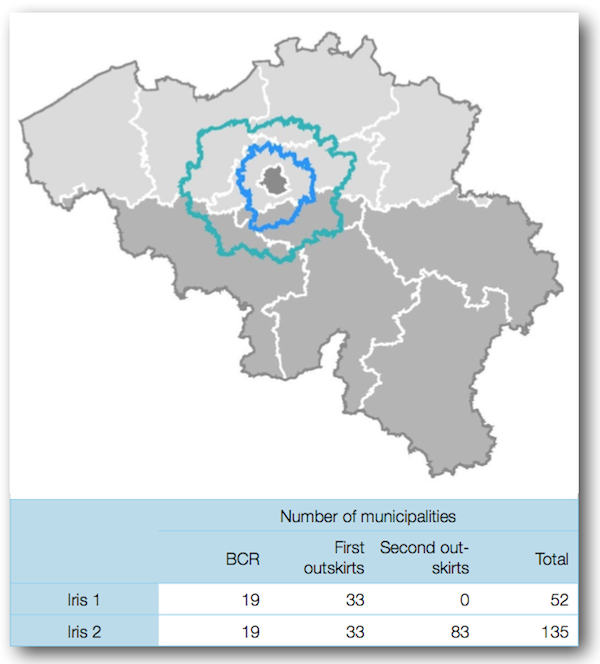 11BCR alone accounted for 714 111 jobs in 2010, compared with 658 787 in 2000 (+8.4%), more than half of which were held by non-inhabitants of Brussels. This growth is however less rapid than that observed on the outskirts, which probably explains the slightly increasing trend of the outbound commute [Lebrun et al., 2012: 19]. BCR also accounts for approximately 250 000 students in preschool, primary and secondary education, close to 80 000 students in higher education, more than 20 000 businesses [Ministry of the Brussels-Capital Region, 2012], and a very high number of cultural activities. 13All of this means that there are a lot of people to be transported, in particular via public transport, in a context in which its use is increasing (more so for inbound and outbound traffic than for internal traffic – see table 1). 15In this context of population boom and expansion of activities, the access to the latter may prove to be a problem. “The ability to move about in our urbanised societies has become indispensable. The right to work, to housing, to education, to leisure, to health, etc. are thus based on a sort of generic right which controls all of the others, namely the right to mobility” [Orfeuil, 2011: 1].12 It is not about a right to move about, but a right to the access to various resources which people need. But, this accessibility, which should be guaranteed to everyone, should not be unconditional. 17For the inhabitants of Brussels, the major challenge is to have better connections between the different parts of the city [Corijn, 2013]. It is often difficult to travel in the city, even between nearby neighbourhoods (for example, between Forest and Anderlecht or between Laeken and Evere), which penalises those who do so, in particular via means other than by car. 18Let us examine the challenges related to accessibility and connectivity within the city according to the mode of transport used. Certain actions taken by the authorities will be mentioned when they are direct responses to these challenges. 15 The availability of a parking space will be discussed in point 1.3. 19Owning a car may be seen as an element of the “mobility portfolio”15 which makes up the “right to access” of individuals and households (due to the flexibility it provides in terms of travel) and as the consequence of the lower density and temporal amplitude of the public transport service. 20In Brussels, following the conjunction of various factors (pauperisation, lowering of the average age of the population, and to a lesser extent, a voluntary choice, facilitated by the improvement in alternatives to the car), the rate of motorisation of households has decreased and today is far below that of the rest of the country and the outer suburbs. In 2010, the percentage of households in Brussels which had at least one car was 64.8% (–3.5 percentage points in 10 years) compared to 82.6% of Belgian households (–1.7 point) and 87.5% of households from the outskirts. The share (approximately 11%) of Brussels households with two or more cars was close to three times less than elsewhere in Belgium. 21This decrease in motorisation is coupled with a drastic decrease in the modal share (table 1) of the car (–17.6 point in ten years, i.e. 32% of travel), being ousted by walking as the main mode (+4.4 point, i.e. 37%) for internal traffic in the Region. Of course, it must be borne in mind that the decrease in the share of the car does not lead to a similar decrease in the number of cars on the road (because, as we have seen, there was a high increase in the population during the same period), or in the distances covered by the people who travel in the area considered. 22This being said, not owning a car is still often seen as a handicap in Brussels when one wishes to travel at certain times (for example, evenings or weekends) to certain destinations which are poorly serviced by public transport, or accompanied by others, in particular by young children [Montulet and Hubert, 2008]. Conversely, owning a car puts a strain on the budget of many households which cannot or do not wish [Ansay, 1997] to go without one. Given that the political objectives of BCR are aimed at reducing the use of the car in the city (cf. point 2.2), should we not do away with this paradox by making it even more possible to live in Brussels without owning a car? 23The decrease in car ownership in the city does not mean that this means of transportation is not used in certain circumstances. Carpooling or car-sharing may thus represent worthwhile complements when the car is thought of as “a service” [Certu, 2013]. 25This service attracts a growing number of clients (at the end of 2012, Cambio Brussels had close to 10 000 clients) with an annual average increase of 40% [Lebrun et al., 2012: 76]. But, paradoxically, there are less stations in the working-class neighbourhoods than in the more well-off neighbourhoods, when in theory there is more of a need in the former to lower costs related to the purchase of a car. Are the rates, access conditions, publicity, uses and/or types of vehicle available poorly adapted to these populations? 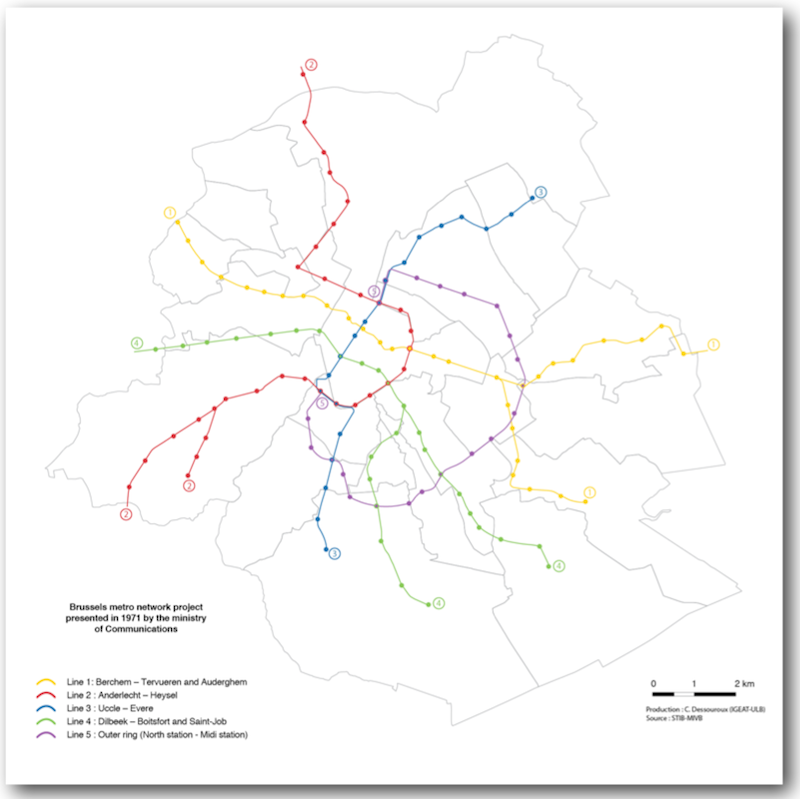 26The urban public transport network in Brussels is well interconnected overall, although it is dominated by radial lines, which makes crosswise travel sometimes difficult. In many places, the canal area constitutes a barrier for east-west traffic, especially in the north and in the south. Access to employment areas situated on the edge of BCR or further in the metropolitan area remains difficult without a car. 27This situation could be improved by the creation or extension of tram lines, as planned by BCR and the Flemish Region (cf. infra), and by further integrating the railway service into the urban public transport network. But this cannot be done without a clear vision of the areas to be developed in the framework of a more polycentric city [Corijn, 2013]. 28At temporal level, the frequencies are relatively high during peak hours on working days during the school year but do not compete with the car outside these hours, especially for bus and tram [Lebrun et al., 2002: 58‑59]. New means will be allocated by BCR in the coming years to a temporal extension of the public transport service, as the difference is currently very significant (an average interval between vehicles which is up to three times longer than during peak hours). But will this be enough to increase the attractiveness of public transport? 17 This observation had already been made in 1999 during the MOBEL survey [Hubert and Toint, 2002]. 29In order to reduce the difference between peak hours and the other periods, travel for reasons other than work or school must be taken into better consideration, and for work, the increasing diversification of timetables. Travel to the workplace and school represents a minority of travel as a whole (about 20% when the return to the place of residence is considered distinctly).17 The other reasons for travel (courses, visits, leisure activities, etc), which account for twice as much, take place throughout the week (outside the school year more than during the school year for working days) but increase drastically on Saturdays, Sundays and public holidays. Thus, for example, Cahier No. 2 of the BCR Observatoire de la mobilité [Lebrun et al., 2013: 10] shows that after working days during the school year, Saturday is the day when, proportionately, people travel most (65% of a working day during the school year), even before a working day outside the school year (when there is hardly more traffic than on a Sunday or a public holiday). 31As regards the train, the Belgian network rail junction is the heart of the problem. The north-south junction, used daily by one third of the passenger trains in the country, i.e. approximately 1 250 trains [Infrabel, 2012], offers low capacity during peak hours, at least in terms of the number of trains (several longer or double-decker trains could be used). The problem of saturation will emerge once the RER begins to operate. Different scenarios may be considered in order to deal with it, including the avoidance of the north-south junction by certain trains (terminuses or use of other existing junctions19) or the building of a new tunnel, on the existing site or on a new line. These different options of course have different consequences with respect to public finances and the chosen model of city. 32It has been known for a long time [Bailly, 1979; O’Farrel and Markham, 1974] that “travel time by car is highly underestimated, whereas travel time by public transport is overestimated in significant proportions” [Kaufmann, 2002a: 134]. This fact is related to a more pronounced feeling of control in the first case. 33In order to compete with the car, public transport must therefore be reliable and quick. The service speed of STIB vehicles has stagnated for several years at 16‑17 km/h on average for the surface network, due to insufficient protection with respect to car traffic (70% of the tram network is protected but less than 20% of the bus network) and a system of remote-controlled traffic lights which is having a hard time being implemented [Lebrun et al., 2012: 63]. Only the underground seems capable of providing a service speed close to 30 km/h. As a comparison, measurements of average speed in a car from 2009 indicate 33 km/h in the free network (between 5am and 6am) and approximately 18 km/h during peak hours [Lebrun et al., 2013: 25]. 34Kaufmann [2002a] also shows that the modal share of public transport increases when it is actually at least as fast as the car, but that this is all the more true if the perceived duration is favourable to public transport. He explains that the latter is influenced negatively by the number of breaks in continuity. By requiring an additional effort on behalf of the user and by creating incertitude regarding successive waiting times, they reinforce the overestimation of travel time in public transport, all the more during off-peak hours. This was confirmed empirically by Stratec in a study which compared the actual and perceived travel time of journeys before and after the restructuring of the STIB network [Geerts et al., 2006]. 35A network without a break in continuity obviously does not exist. But designing a network by avoiding unnecessary breaks in continuity as much as possible on the busiest lines clearly improves the situation from the user’s point of view [Dobruszkes et al., 2011]. 20 This principle has already been partially implemented by STIB via the BIM fare. 37The low socioeconomic level, the lack of room in dwellings in Brussels and cultural obstacles, explain the low rate of bicycle ownership in Brussels: only 39.9% of Brussels households have one compared to 74.8% of households on the outskirts. And the situation is not progressing. Furthermore, three times more households in Brussels (29.7%) than households on the outskirts (8.5%) claim that they do not have enough room in their home for a bicycle [Lebrun et al., 2013: 40]. Despite this, bicycle use has tripled in 10 years (table 1), probably thanks to the improvement of the roads (table 2), the existence of bicycle-sharing and the evolution in mentalities. 38The above fully justifies the recent implementation of a bicycle-sharing system. The lightning start of Villo! (between 2010 and 2011, increase of 81.1% in the number of members and 139.7% in the number of rentals) must not however hide the fact that only 2.5% of inhabitants of Brussels aged 18 and older were members at the end of 2011. It is therefore necessary to question the inequality of material (having a bank card or credit card) and practical (ability to ride a bicycle) access to this service. 39Furthermore, the development of safe and sheltered parking spaces for bicycles is probably a significant challenge in neighbourhoods where there are mainly dwellings with no room for bicycles, and is part of the BCR “bicycle plan” and the missions of the future regional parking agency. 40In order for walking – which is already the main mode of travel in Brussels – to develop more, in particular for short distances (40.6% of internal traffic in BCR equals a distance of under 2 km), it is necessary to make it safer through the adequate development of roads (in particular traffic calming areas as well as residential and pedestrian areas) and crossroads. 41Shortcuts, pedestrian itineraries and signs may also improve the efficiency and comfort of walking, as well as the creation of new ways to get across physical barriers (railway, canal, motorway, etc) and specific equipment for walkers while resting (benches, drinking fountains, etc). BCR is developing a “pedestrian plan” to this effect. Its aim is to bring walking back to the heart of the development of public spaces and urban mobility policies, in a logic of universal accessibility. 42On 1 January 2011, it was estimated that there were between 360 000 and 380 000 cars used by the inhabitants of Brussels [Lebrun et al., 2012: 38]. Considering the fact that for 95% of its existence a vehicle is parked [Certu, 2013], mainly at the place of residence (73% of the total amount of time), there are a lot of unused vehicles which occupy public space and make it difficult to find a parking space in many residential neighbourhoods, in particular central neighbourhoods, which have very few private parking spaces and where the needs often exceed the available capacity. Of the 750 000 parking spaces in Brussels, 38% (280 893) are in the street and 26% (197 400) in dwellings [Lebrun et al., 2012: 35]. If a neighbourhood also attracts visitors and customers, competition for parking spaces becomes tough. 43The challenge is great: in an increasingly dense city, the function of public space is not only related to traffic, but also to living, in particular for all of the households without a garden or a balcony. Public spaces without illegally parked cars and which are designed according to the expectations and needs of different categories of the population constitute a necessary condition for increasing the quality of life in the city. 44The regional parking plan being developed aims to regulate the situation. Its objective above all is to discourage the use of the car in the dense city, though paid parking (red, orange and green areas) or limited parking (blue areas). In other words, through these restrictive measures, drivers will hopefully make use of available alternatives as often as possible, and leave their cars near their homes, where they have local resident cards, thus increasing – it must be pointed out – the amount of time cars remain parked. This behaviour has already been verified by studies on the subject of travel (table 3). 45For all of these vehicles left in the street near people’s homes, in reality there are only two options if some of the public space is to be freed up: either reduce the rate of motorisation or create additional parking off the roads. The first solution brings us back to the previous point (1.2) and in particular to the car-sharing formulas to be developed. As regards additional parking, several initiatives are being taken by the Region: foreseeing a sufficient number of parking spaces in every new block of flats, and even extra ones for local residents to use; allowing residents to use the parking spaces of nearby offices or businesses during the evening and night (but there is little spatial concurrence between residential and productive or commercial functions); creating new public car parks in residential neighbourhoods, for example in reorganised public spaces. All of these measures of course represent a certain cost. 46In the office neighbourhoods, the situation is very different but the problem is similar. With 181 400 private parking spaces, which are concentrated mainly in the pentagon and its surroundings, the north neighbourhood and the European quarter, the abundance of free parking spaces constitutes a strong incentive to use one’s car, all other things being equal and even when public transport is faster [Kaufmann, 2002b]. This has been confirmed by other authors [O’Fallon et al., 2004; Ye et al., 2007] and validated empirically in Brussels [Lebrun et al., 2013: 56 and table 4].21 The recent Code bruxellois de l’air, du climat et de la maîtrise de l’énergie (COBRACE) attempts to deal with this situation by reducing the number of off-road parking spaces during the issue or renewal of environmental permits. 47The public car parks (24 500 spaces), situated mainly in the pentagon and in the upper part of the city, as well as the off-road car parks of businesses (26 600 spaces) also play a role in attracting cars, but for other activities (businesses, restaurants, culture, etc.). 48Before the actual creation of the Walloon and Flemish Regions in 1980 and BCR in 1989, mobility22 was a national affair and a matter for two separate Ministries: Public Works and its Road Administration,23 and Communications and its Transport Administration [Hubert, 2008b]. This duality reflected the battle after the war between the car and public transport, by intervening administrations. Intermodality was not an option: one was either a motorist or a public transport user, but rarely both according to the moment and the need (and even less a pedestrian or a cyclist). Nor was it an option to share public space among users. The car was the dominating norm and the flow of car traffic had to be favoured, to the point that the post-war economic boom was a time when the car was king [Hubert, 2008a] and public space was swallowed up by it. In this context, the compromise agreed on so that public transport could continue to develop without impairing the flow of car traffic was to bury it. The creation of STIB’s Service Spécial d’Etudes (SSE) in 1963 to manage the design and building of the underground tramway and railway in Brussels, succeeding the Office national pour l’achèvement de la Jonction Nord-Midi, thus continued the expertise acquired by Belgian engineers as regards the underground [Tellier 2010; Tellier, 2012]. 28 See the law of 21 March 1991. 52Following the institutional reform of 1988, the roles and missions of the STIB Service Spécial d’Etudes (SSE) were taken over by a directorate within Bruxelles Mobilité, namely the Direction de l’Infrastructure des Transports Publics (DITP). Today, this directorate is made up of a majority of STIB staff posed in the Region32 and pursues the studies and realisation of works for the development of the underground network and the improvement of existing infrastructures. The maintenance of the SSE at the interface between STIB and the regional administration was decisive in terms of the choice to develop the public transport network in Brussels. Among others, this was what allowed STIB to continue to play an active role at operational level (operating and commercialisation) as well as at tactical level (determining the network to implement in order to reach objectives), and even at strategic level (defining objectives) [Masi, 2009], according to what was provided for in the management contract.33 This shows the extent to which the services of the administration (in the broad sense) must not be seen as passive entities but as technical bodies capable of ensuring in the long term the concrete implementation of a vision of the city and its organisation [Zitouni and Tellier, 2013]. 53Mobility of course does not stop at the regional administrative boundaries. The institutional reform of 1988 provided for a dialogue between the Regions and the federal state for public works and transports, as well as mandatory cooperation agreements when there was an “overstepping” of boundaries (as in the case of the Brussels ring road or the E40 motorway which, between Brussels and Liège, crosses the linguistic boundary several times). Thus, the cooperation agreement signed on 17 June 1991 between the three Regions specified who was in charge of the management of the different roads at the regional borders. 55But when the organising authorities and different operators carry out activities on the same territory, their action often lies in an “area of rivalry” [Damay, forthcoming; Nahrath and Varone, 2007]. The case of the Brussels RER is a good example of this (cf. point 3.2). As regards regional operators, even if the collaboration is making good progress between STIB and De Lijn on the latter’s project to create tram lines connecting Flemish Brabant and Brussels (the “Brabantnet” in the framework of its “Mobiliteitsvisie 2020”35), questions such as the length of these lines, the location of terminuses, the available capacity on entering BCR and service during off-peak hours inevitably bring into play contradictory visions of the city (spread out or dense), the target public (the inhabitants of Brussels, the “rand” or beyond) and the service to provide (centred mainly on home-work travel or also on the other types of motive). As regards TEC, there are no largescale initiatives similar to the “Brabantnet” in sight, but its most recent lines (“Conforto” bus connecting Louvain-la-Neuve and Brussels) are becoming more integrated into the STIB heavy network (terminus at Delta-Etterbeek and Roodebeek) than certain lines of De Lijn which, in order to avoid as many transfers as possible for their users, go directly into the heart of the city. 56As regards ticketing and fare integration, there is the “Jump” card for 10 journeys and the “Métro-Tram-Train-Bus (MTB)” pass, which are valid throughout the BCR territory and for all operators (STIB, TEC, De Lijn and SNCB). But in recent years, STIB has established their own fares which are cheaper than the integrated formulas, as well as new ticketing (the MOBIB card), which have not yet been implemented by the other operators. The accessibility and reputation of integrated offers have therefore suffered. However, in 2015 the MOBIB card will be implemented by all operators of Belgian public transport. But the protocol of interministerial agreement between the three Regions and the federal state allowing this dates from May 2006, and it is still unknown as to what type of fare integration for the RER area (in the form of areas or duration) this ticketing will be used for. 57In this context, the creation of the “Metropolitan Community of Brussels” (in French “Communauté métropolitaine de Bruxelles”, and in Dutch “Hoofdstedelijke gemeenschap van Brussel”), resulting from the federal government agreement of 2011 and set within the special law of 19 July 2012, seems welcome due to the fact that it may represent the privileged forum for the coordination of the transport service in and around Brussels. Situated at the level of the former unitary Brabant, this authority, which was established especially for Brussels, must be made up of the three Regions, the federal authorities, all of the municipalities and, optionally, the two Brabant provinces. This community is struggling to be implemented36 and its authority may be quite limited,37 as well as its area of competence [Van Wynsberghe, 2013]: although it potentially concerns all matters of “supra-regional importance”, coordination has not been planned regarding urban development, while urban sprawl is a major cause for the increase in travel needs. There are an extremely limited number of areas explicitly being considered as regards mobility (access to the ring road, road safety and roadworks). The integration of public transport is not mentioned as such and the operating of the RER is excluded, to be devolved to a SNCB internal structure with representatives from the three Regions and the federal authorities [Van Wynsberghe, 2013; Wunderle, 2011]. 58This being said, in the new management contract (2013‑2017) signed between BCR and STIB (article 50), the two parties agree to continue their collaboration efforts with De Lijn and TEC, by conducting a critical analysis of the existing agreements, the evolution of the institutional landscape (“metropolitan community”), mobility needs and future projects. If necessary, “this analysis will lead to a proposal for a new cooperation agreement intended to facilitate relations between the three operators and establish the appropriate framework for the development of their service”. 38 www.beliris.be, historical tab, consulted on 8 April 2013. 59Finally, our overview of the institutional context would be incomplete if we did not mention Beliris. Signed on 15 September 1993, the cooperation agreement between the federal state and BCR, called “Beliris”, was the result of the will to “promote the international role of Brussels and its function as a capital”.38 Major mobility projects were thus financed by Beliris, such as the Schuman-Josaphat railway tunnel, the development of RER stations (Vivier d’oie, Meiser, Bordet, etc. ), the renovation of underground stations (Schuman, Arts-Loi, Bockstael, Comte de Flanders, etc. ), the extension of tram lines 94 and 62, the complete repair of many roads (west inner ring, Boulevard de l’Impératrice, Mont des arts, Place Cardinal Mercier, Chaussée de Gand, etc.) and the development of the cycle path in Rue de la Loi. Over time, the Beliris interventions have diversified and today concern many different areas. The initiatives supported are negotiated by the cooperation committee made up of four federal ministers and four Brussels ministers.39 The federal state presides over Beliris (in the person of Laurette Onkelinx since 1999) and is responsible for carrying out initiatives. The practical implementation takes place via the Direction Infrastructure de Transports of SPF Mobilité et Transport, in conjunction with the regional authorities via a coordination committee. The “first package” of the sixth institutional reform, adopted on 19 July 2012, initially provided for the integration of Beliris into the regional administration but this project was abandoned, which brings to mind the fact that, since the beginning (i.e. barely four years after the creation of BCR), this cooperation agreement also translated the will of the federal state and, through it, the other two Regions to maintain an influence on the choice of major projects to carry out in Brussels. 61Article 13 of the new management contract between BCR and STIB places special emphasis on collaboration with the local authorities. There are therefore plans to “strengthen the dialogue with the municipalities by involving them in projects upstream” and to develop “a formal consultation procedure with the municipalities by 1 January 2014 at the latest” during the introduction of planning permission for major projects. BCR and STIB have also asked the municipalities “to add clauses to the mobility agreements in order to encourage them to collaborate in the realisation and implementation of certain public transport projects”. And last but not least, “if the municipal infrastructure does not allow the normal operation of buses or trams, and the possibilities to improve this operation are not implemented, STIB may propose to adapt its services according to the following procedure: 1. STIB informs the Region of the problems encountered; 2. The Region has twelve months to find a solution with the municipalities concerned; 3. After this period, STIB is free to adapt its service, in keeping with the spirit of the approved master plans”. The management contract – a measure which is the result of a feeling of exasperation with respect to the difficulties involved in realising certain projects – could as a last resort cause STIB to cut back on its services on certain lines or to divert others. 62The Plan régional des déplacements Iris 2 [Brussels-Capital Region, 2011: 136] mentions the necessity to reinforce coordination not only with the municipalities but also between regional entities (Bruxelles Mobilité, Bruxelles Environnement, AATL, etc) and with the police and the public prosecutor’s office. 63Finally, at the beginning of March 2013, the eight parties which negotiated the sixth state reform made the first results of their discussions known regarding internal reform in the Brussels Region. As regards mobility, there are plans to provide a regulatory framework for the Iris Plan, which was renamed the Plan régional de mobilité (PRM). It will be valid for two terms and the Plans communaux de mobilité will have to conform with it for the sake of coherence. There are also plans for the creation of different tools to guarantee the implementation of the PRM. A new order was adopted to this effect on 12 July 2013 by the Brussels parliament. 64The Iris Plan is a “strategic plan” which sets the objectives of BCR regarding mobility. It constitutes the “travel” section of the Regional Development Plan (RDP). “Almost ten years later, the evolution of regional mobility is very worrying. Certain important measures of the Iris 1 Plan have not been implemented, while mobility needs have increased greatly” [Brussels-Capital Region, 2011: 12]. 67As regards bicycles, on page 47 we find the objective for the bicycle to represent 20% of mechanised travel (therefore excluding walking) in BCR by 2018. The Region also has plans to make it possible to cycle on 100% of roads by 2018. “the CO2 emissions from transport must, of course, also be reduced significantly, and be in keeping with the European trend to decrease by 30% by 2020 with respect to 1990. As regards noise, the situation must also guarantee that WHO (World Health Organization) objectives are met. The urban space must be at the service of all, and above all to pedestrians”. 69Aware of the accumulated delay during the drafting of the Iris 2 Plan, the new Secretary of State for Mobility, Bruno De Lille,42 decided that the Direction Stratégie of Bruxelles Mobilité would be responsible for developing an internal and permanent tool for the modelling of travel – the “strategic multimodal travel model” – which would be capable of guiding decisions and preparation for later plans and, for ensuring the management of Iris 2 [Monneaux, 2012]. Twelve cross-cutting themes [Bauchau, 2012], involving just as many “trades”, were therefore defined as making up the Iris 2 Plan and were presented during a working day held on 1 October 2012 during the first meeting for the implementation of the mobility policy in Brussels, attended by all of the city’s mobility stakeholders. Working groups for each theme must now ensure the management with the help of resource persons. 70Will this be enough to put an end to the causes for the failure of the Iris 1 Plan [Hubert, 2009]? The example of the remote-controlled traffic lights presented in the box below, allows an understanding of the difficulties to implement certain measures. 71The fact remains that we seem to be witnessing a slow shift in the centre of gravity of public action towards the regional administration, in particular the Direction Stratégie of Bruxelles Mobilité, which attempts to play its role to the fullest as “organising authority”, with its control of the planning. Thus, will it be able to reorientate the mobility policy in BCR? Indeed, the objective is reached one step at a time [Zitouni and Tellier, 2013] but other technical bodies support the same ambition in their own way: the Direction Infrastructure des Transports Publics (DITP, formerly SSE) and the Direction Projets et Travaux d’aménagement des voiries (DPT) within the same regional administration, STIB’s “Network” and “Strategy & Innovation” departments, and the Beliris administration whose role is growing as mentioned above. Not to mention the exterior stakeholders (public works companies, various pressure groups, etc.) which also try to influence the future of mobility. 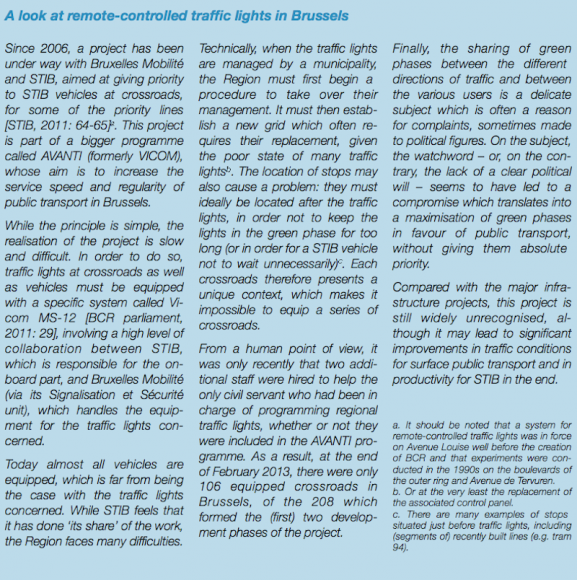 The system of action for mobility is especially complex in Brussels and the balance of power between stakeholders is formidable: the concrete daily outcome for dealing with the problems remains uncertain after reading the Iris 2 Plan. 72An important aspect of strategic planning for mobility stakeholders is, in the words of Céline Tellier [Tellier, 2012], to keep the possibilities open. From this point of view, it is essential that all of the important projects are mentioned in it, even if they are accompanied with certain reservations and are not yet guaranteed in terms of financing or timetable. The “catalogue of good intentions” aspect of the Iris Plan is therefore not innocent. 73With Frédéric Dobruszkes [Dobruszkes, 2009], we may consider that regarding public transport infrastructures, the Iris 2 Plan marks the “return of great ambitions” for the underground in Brussels, but that “the question is clear as to the financing of this ambitious project”. Two largescale projects are mentioned for the short and medium term – the automation of lines 1 and 5 [Verwilghen, 2012] and the extension of the underground towards the north (Schaerbeek) by 2018 – and two others are envisaged for the long term – the gradual transition to the underground at the outer ring and the extension towards the south (Uccle) – with certain conditions [Brussels-Capital Region, 2011: 69]. This comeback was heralded by a specific study conducted at the end of 2006 predicting the saturation of the underground (where the occupation rate of underground trains was reduced from four to three standing passengers/m243) and an intense lobbying campaign under the title of “Métrovision” [STIB, 2009] during the inauguration of the “finishing of the inner ring” and with the approach of the 2009 regional elections [STIB, 2009]. 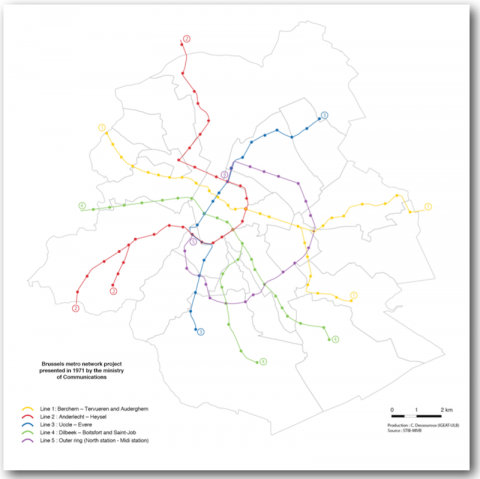 74Other major infrastructure projects are also mentioned in the Iris 2 Plan, without reaching the amounts necessary for the realisation of the underground programme: the extension of certain tram lines, the conversion of very busy bus lines (such as 71) into tram lines [Brussels-Capital Region, 2011: 65], the implementation of bus lines “with a high level of service” (BHNS) [idem: 66‑68] and the consideration of certain roadworks not so much to increase the capacity of roads but to make the surface more user-friendly [idem: 91]. 75The 2013‑2017 management contract between BCR and STIB allows a more concrete idea of the infrastructure works which the parties agree to carry out as a priority. As regards the tram network, several lines will be extended (62, 94) or created (9, 71). A “railway network master plan” for the 2017‑2025 period will be developed to prepare the realisation of major underground projects which will be introduced gradually, beginning in 2018 (automation of lines 1 and 5, extension towards the north and subsequent reconfiguration of the Constitution tunnel and Albert station, and underground tramway tunnel under Place Meiser44). 76It is interesting to note (art. 12 of the management contract) that a strategic committee, composed jointly of eight members from the highest level along with the necessary experts, will be in charge of the planning and coordination of preliminary studies for the development of the network and the realisation of regional public transport infrastructures. 77Public transport is the cornerstone of the BCR mobility policy. As we have seen, only the STIB network is within the competence of the Region. We shall therefore focus on this operator here, even though in order to be thorough we would have to consider the means allocated to TEC and De Lijn when they operate in Brussels. But such estimates are difficult to carry out. As regards means pertaining to the SNCB, they will be mentioned in point 3.2 when the 2013‑2025 investment plan is discussed. 78It is often expensive to operate an urban public transport network. In 2012, STIB operating expenses reached 521 million euros (370 million of which were staff costs).45 53.6% (i.e. 279 million) of these costs were covered by its own revenue, of which 186 million came directly from passengers’ tickets. 79This type of network cannot meet growth demands unless additional means are allocated to it to improve the service. The main means are the increase in the frequency of service (which requires new vehicles and more drivers), the use of vehicles with a bigger capacity when possible or an investment in a mode of transport with more capacity (tram instead of bus, underground instead of tram). The STIB-BCR management contract estimates the “indicative programme for investments” at more than 4.75 billion euros for the 2012‑2021 period, i.e. an average of 475 million per year, more than 60% of which is for the underground mode alone. 80Where will the money come from? Discussions were longest on this point during the elaboration of the management contract, and the solutions are relatively uncertain. A significant share (approximately 50%) of BCR’s annual allocation for STIB (485.5 million euros in 2013, i.e. approximately 20% of the regional budget, which represents the biggest item) is devoted to the operating deficit and the rest to investments (rolling stock, railway network, technical equipment, buildings, etc) and to the improvement of security (not counting the means allocated to this item by the federal Ministry of the Interior). 81This is of course not enough to carry out the programme of additional investments envisaged. Three approaches will be taken. The first consists in realising productivity gains. The management contract evaluates them at 116 million during the 2013‑2017 period. These amounts, saved on the operating budget, will be transferred to investments. It should be noted in particular that the improvement of the service speed and the regularity of surface lines allows significant productivity gains [Dobruszkes and Fourneau, 2007]. 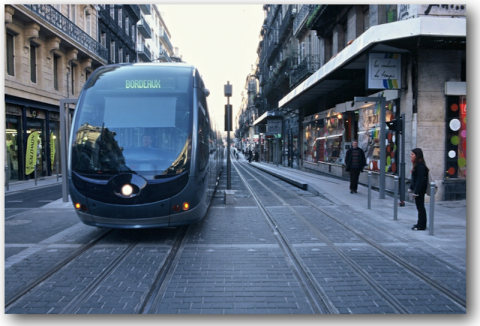 82A second approach consists in increasing BCR’s contribution: a “special allocation” is thus attributed to STIB for improvements in the service resulting, on the one hand, from improvements in frequency and scope and, on the other hand, the operating of new lines and extensions of the network (from 6.4 million euros in 2013 to close to 95 million in 2017) (art. 68 of the management contract). 83But it is difficult for BCR to do more, given its limited financial resources. It is however urgent to move forward in order to improve the situation of daily mobility in Brussels as well as to meet the Kyoto objectives if the Region wishes to avoid having to buy CO2 emissions rights for exceeding norms [Brussels-Capital Region, 2011: 140]. 84Is it therefore necessary to turn to loans? This is not excluded (including the European Investment Bank) but, “as the STIB accounts are consolidated with those of the Region, the worsening of the operator”s debt can have a harmful effect on the rating given to the Region by the rating agencies and therefore on its borrowing conditions’ [Goethals, 2012: 3]. STIB had to borrow large sums of money (even to finance its operations) in BCR’s first years of existence. Thanks mainly to a rise in rates which was faster than inflation [Goethals, 2012; Hubert et al., 2009], STIB was able to reduce its debt by 75% in ten to seven years, from 500 million euros in 1994 to 125 million in 2011. Indeed, it is still possible to bring STIB out of the scope of regional fiscal consolidation to increase its borrowing capacity but, in order not to repeat the failure of 2007 (following the negative opinion of Eurostat, the European body responsible for verifying compliance with rules regarding public debt), the rate of coverage of operating costs by its own revenue should reach 50% according to the accounting standard sec95.46 This being said, a deconsolidation would not be without risk for the Region, which would be forced to recapitalise STIB in the event of difficulty. 85Finally, STIB and BCR turn in other directions first to supplement investment means (art. 73 of the management contract). This involves first of all obtaining additional funds from Beliris (in the order of 50 million per year for 10 years), in addition to the means already allocated to STIB in this framework. But, in the framework of the adjustment to its 2013 budget, the Federal government decided on 1 July to reduce the Beliris budget by 10 million. It is therefore difficult to see how this approach could be taken, except to the detriment of other needs. It would then involve taking the same amount from the “refinancing of Brussels”, obtained in the framework of institutional agreements. Even so, public-private partnership formulas are not excluded (art. 73 of the management contract), despite the many examples proving that in the end, this costs the community significantly more, but there is no mention yet of revenue from the future regional parking agency, or from urban tolls,47 considered to have benefits by more and more countries around the world [Commissariat général au développement durable, 2009]. 86Along with the means required by public transport, there is of course everything which concerns the development of roads and public spaces for the different users (motorists, cyclists, pedestrians, etc), without always being able to make the distinction between what pertains to traffic and to residence. 87An important item concerns roadworks (such as, for example, the recent tunnel in front of NATO) and especially the maintenance and renovation of existing works. As of 2016, the Léopold II tunnel will be the object of a public-private partnership for its renovation and maintenance, which will lead to the payment by BCR of approximately 15 million euros per year for 25 years to the consortium which will be awarded the contract. Are the public authorities always aware that when they request the building of an underground (road or railway) infrastructure, it often involves a long-term commitment which leads to recurring and often considerable costs? 88Finally, we shall discuss two important undertakings concerning the public transport service: the extension of the STIB railway network and the realisation and operating of the future RER network. 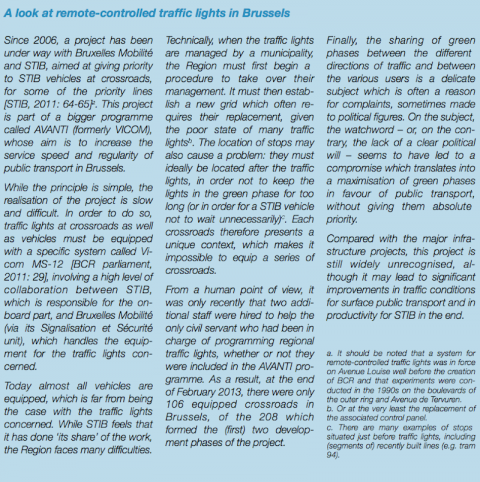 Many other cases would deserve some attention here, but we have chosen two undertakings which are both extremely important for public finances and potentially decisive for the future of mobility in Brussels and the decrease in the use of the car in the city (first objective of BCR). 48 On the shared sections of lines 1/5 and 2/6, during peak hours. “As it is very efficient, [the underground] has the advantage of transporting a large number of passengers. With entirely separate rails, users prefer it and thus completely avoid traffic jams” [Brussels-Capital Region, 2011: 69]. These arguments have not changed since the 1960s. Céline Tellier defines it as the “reference of the functional, rapid and accessible city” [Tellier, 2012: 70]. As a result of modernist and functionalist ideas from the interwar period, it is based on the principle that the surface is intended for private transport as a priority and that any interference with public transport should be avoided. The compromise which most of the mobility policy of Brussels over the past fifty years has been based on was therefore to bury it. Figure 3 presents the underground network project proposed in 1971 by the (national) Ministry of Communications. While the part of the network which was actually built is somewhat different from what was planned, it is interesting to note that the projects for the future are extremely close to what was envisaged in 1971 (lines 3 and 5). 90Thanks to Expo ’58 in particular [Hubert, 2008b], the railway surface network has not been taken down completely, unlike other cities in Belgium and abroad. But it has only been since the creation of the Region that it has redeemed itself in the eyes of decision-makers. The extension of line 94 has led to new projects for STIB, and De Lijn wishes to create a network of trams to serve the outskirts. But until now, these projects have been concentrated on the major boulevards of the outer ring, where it was still possible to coexist with the car. Apart from the possible service to the Central Station, no concrete project concerns the pentagon, for example, where trams still exist only on the royal route and the west inner ring. In BCR, trams have therefore not been used in the dense city as a tool for urban regeneration, based on the reference of sharing the public space [Terrin, 2011].49 Each time major competition between public transport and the car could have led to a strong choice in favour of public transport, until now we have observed either a status quo or unsatisfactory compromises (for example, Chaussée de Charleroi, “goulet Louise”, Chaussée d’Ixelles, etc), or a return of the functionalist reference with the solution to bury (Rue Gallait, Place Meiser, etc). This is why the regional project to replace bus 71 with a tram represents a test which could lead to sections of Chaussée d’Ixelles being car-free and used only by public transport, pedestrians and cyclists, as seen in many cities. But article 26 of the management contract between STIB and BCR already puts forward a compromise by indicating, even before conducting studies, that car traffic will be maintained in Chaussée d’Ixelles in one direction, except on Saturdays during the day. Figure 4 shows an example of a street which corresponds more or less to the size of Chaussée d’Ixelles in its narrowest part and the impact of maintaining a roadway on the width of pavements (on the left). 91The “return of great ambitions” for the underground [Dobruszkes, 2009; STIB, 2009] illustrates the still considerable influence of the expert technical corps of the underground in Brussels [Zitouni and Tellier, 2013]. The radical rejection of alternatives, such as for example “Cityvision” [Lebrun et al., 2009], is an indicator of this [STIB and Bruxelles Mobilité, 2010]. 50 Cf. the ]Pyblik[ training programme supported by BCR (www.pyblik.be). 92Despite the emergence of a new public space culture (e.g. the recent development of Place Flagey, Place de la Monnaie, Place Rogier, etc),50 we cannot say that an equivalent coalition made up of transport engineers as well as urban planners and landscape architects, supported by the entire political world, has been able to assert itself in favour of the surface and a regeneration of public spaces. 93More prosaically, the question arises as to whether the announced date (initially 2018, already delayed until 2022) for the operating of the north underground is realistic given the current perspectives for public finances, and whether this project will have a lasting negative effect and financial impact on other extensions of the network and/or on other urban needs (cf. point 2.3. above and the impact of these investments on the Beliris budget and on the one related to the refinancing of Brussels). We may also question the lack of improvements in the existing service (with plans to complete them within ten years in the best case, but past experience with major infrastructure works in Belgium leaves no room for optimism) for this part of the city. 95But this project, governed by the law of 17 June 2005 following an agreement in 2003 between the federal state and the three Regions, keeps falling behind. Now 2023 is said to be the new horizon, yet the idea was already part of political debates in Brussels since the creation of BCR in 1989 [Damay, forthcoming]. 96Given the increase in traffic congestion, commuters are awaiting the arrival of the RER. It also represents a major challenge for Brussels. The density of the railway infrastructure is such that52 its most intensive use would allow a bigger modal share for the train, including internal traffic. In 2010, the train represented barely 1% of internal traffic, compared to 27% for inbound/outbound traffic in the Region [Lebrun et al. 2013: 49]. The railway services are therefore above all calibrated according to pendular movements,53 and do not yet play a role in Brussels as a complement to STIB. Finally, the RER is also an occasion to develop new urban hubs, and thus to aim at a polycentric city where the transport demand is distributed better (cf. PRDD project). 97These two points of view summarise a conflict of use. They are however not irreconcilable, as a quantitative increase in the service would at the same time enable services “of an urban type”, with a better spatial and temporal distribution of the service in the city. Furthermore, the improvement in the flow of pendular movements and the shifting of traffic which may result could also improve the quality of life in Brussels. 98The realisation of the RER project proves to be difficult however, which we understand better when we consider the project’s multiscalar aspect with multiple stakeholders.54 This is why the stakeholders have not yet been able to agree on an operating plan (timetables, frequencies and stops) [Frenay, 2009], or on the additional stations to create in BCR [Lebrun and Dobruszkes, 2012],55 due to their very different interests (or the perception they have of them). 100While there are many causes which could explain the repeated delays in the infrastructure works,57 the political will to bring the project to a successful conclusion also raises questions. Given the temporal scale which is currently proposed, it is difficult not to see a lack of will in this planned staggering on behalf of the SNCB58 and/or the federal state. 101In this game of stakeholders, BCR has difficulty being heard in an area which remains above all federal and where the two other Regions appear to agree tacitly that a commuter-oriented vision should be privileged [Frenay, 2009]. The stakeholders concerned have not been able to decide clearly on adequate support measures to guarantee the modal shift from the car to the RER. There is no shortage of studies to indicate that simply improving the service is not enough [Kaufmann, 2000]. In summer 2013, the plan for remaining investments (via the SNCB investment plan) is still not established. BCR – with a new railway expert and a more assertive vision concerning the promotion of the potential of urban stations [BCR, 2012] – can follow this strategic case more easily than before and collaborate in a constructive manner with the other stakeholders. Furthermore, the sixth state reform provides for the participation of the Regions on the board of directors of the SNCB, which could create new perspectives, although the precise procedures for this participation have not yet been defined. 102Travel practices have evolved greatly over the past decade or so. In terms of modal share, the use of public transport has increased sharply, more for inbound and outbound traffic in Brussels (which rose from 15% of the modal share in 1999 to 32% in 2010) than for internal traffic (which rose from 15 to 25%). Walking has become the top mode for internal traffic in BCR (37%), the use of the bicycle has tripled in ten years and the modal share of the car has dropped (from 50 to 32% of total travel), which is less true for inbound and outbound traffic (for which the car is still used in 63% of cases). This goes together with a decreasing trend in the motorisation of Brussels households. 103Contrary to what is often heard, this significant evolution means that the global volume of travel by car has not rocketed and has even decreased slightly in Brussels, with traffic congestion concentrated mainly at the entrances to the city and on the ring road. In an unchanged situation, the population boom seen in Brussels and the multiplication of activities which it generates could have caused a much more marked deterioration. This is not the case. In other words, the status quo is a performance in itself, even if, from the user’s point of view, this gives the impression that the situation is not improving and is even getting worse in terms of travel time in particular. 105A paradigm shift is therefore possible, which consists in considering ourselves to be not only pedestrians, but ’enhanced’ pedestrians due to the use of public transport, bicycles (personally owned or shared), taxis (individual or shared) or cars (individual or shared). With respect to the latter, the impoverishment of the inhabitants of the Region as well as the growing share represented by housing in the household budget, lead us to think that the moment has arrived to implement innovative formulas for car-sharing, which are not limited to external services (Cambio, Zen Car) but instead include private or public-spirited initiatives by groups (companies or others), neighbourhoods and even the city. In total, we need more mobility services, supported by the development of new technologies and applications. These services must of course benefit maximum interoperability60 (the idea of the “smart city”). However, this service-oriented vision must not mask the need to establish a hierarchy of modes of transport to be favoured according to their benefit to the environment and the quality of life in the city. 106The decrease not only in the use but also in the ownership of cars is also a crucial challenge in the development of public spaces. 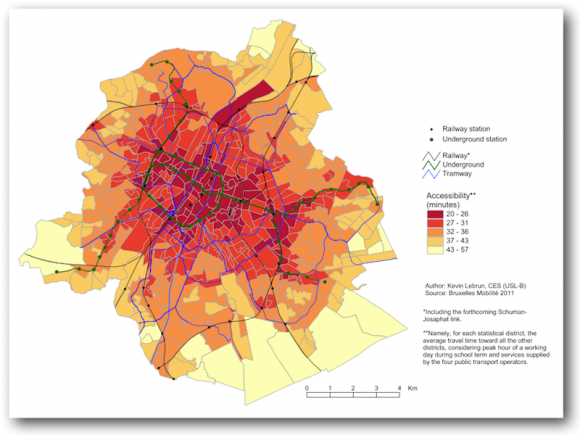 The 360 000 to 380 000 cars (2010 estimate) used by the inhabitants of Brussels, parked (mainly at home) for approximately 95% of their lifetime, represent a true burden for the city and its public spaces, in a context of population growth. The saturation of available parking spaces can be felt in many neighbourhoods, and the creation of additional off-road parking spaces will soon reach its physical and economic limits. This takes place at a time when the decreasing size of dwellings and the demand for a better quality of life in the city lead to the emergence of a need for car-free, high-quality and multifunctional public spaces. 107Furthermore, these different elements will not exempt the public authorities from thinking about regional development. In this respect, the Regional Sustainable Development Plan (PRDD) is impatiently awaited, as it is supposed to determine the areas to be served as a priority in the framework of a more polycentric city. This overall view must guide the choice of investments in transport infrastructures, given that it will not always be possible to connect the different neighbourhoods: all of the (meagre) means available must not be put in one basket (the underground), at the risk of eliminating the chances for a better spatial and temporal networking of the city with public transport. 108This overall view, which all of the (regional and municipal) stakeholders in BCR are called to embrace, must be confronted with that of the two other Regions in a country which today is guided more by a spirit of competition between entities than by a spirit of cooperation. BCR is highly dependent on the policy which Flanders and Wallonia would like to pursue (or not) in order to reinforce the polarities surrounding the public transport hubs, rather than urban sprawl, which encourages dependence on the car. Coordination at metropolitan level will also be necessary, with the support of the federal state (which still supervises the SNCB), to improve the public transport service (RER, Brabantnet, etc) and drastically reduce the use of the car for inbound and outbound traffic, which is a true obstacle to regional development. The authors wish to express their warm thanks to the members1 of the support committee for their remarks and suggestions within the framework of their mission to write a summary for the BCR Observatoire de la mobilité, which they have been working on since 2011, as well as to Julie Tessuto, Sébastien van Drooghenbroeck, Magali Verdonck, Benjamin Wayens and Benedikte Zitouni. The authors are solely responsible for the contents of this synopsis. ANSAY P., 1997, Le désir automobile, Brussels, CFC-Editions, 191 pp. BAILLY A., 1979, “La perception des transports en commun par l’usager”, Transport Environnement Circulation, 32, pp. 23‑28. BAUCHAU D., 2012, “Les 12 travaux du Plan Iris 2”, Le Moniteur de la mobilité et de la sécurité routière, 36, pp. 4‑5. BOOGAERTS P., 2010, “Maximaal groen licht voor bussen en trams”, Verkeersspecialist, 164, pp. 6‑9. BOURDIN A., 2005, “Les mobilités et le programme de la sociologie”, Cahiers internationaux de sociologie, CXVIII, pp. 5‑21. CERTU, 2013, “Dans les grandes agglomérations françaises, une voiture est stationnée 95% du temps”, Transflash, 380, pp. 3. COMMISSARIAT GÉNÉRAL AU DÉVELOPPEMENT DURABLE, 2009, “La tarification, un instrument économique pour des transports durables”, La Revue du CGDD, pp. 1‑110. COOREMANS E., 2012, “La Région entre en gare(s)”, Le Moniteur de la mobilité et de la sécurité routière, 36, pp. 16‑19. CORIJN E., 2013, “Plan et processus de planification comme levier sociétal”, in CORIJN E. (ed), Où va Bruxelles ? Visions pour la capitale belge et européenne, Brussels, VUB Press, pp. 181‑218. CORNELIS E. et al., 2012, La mobilité en Belgique en 2010 : résultats de l’enquête BELDAM, Brussels, Belspo et SPF Mobilité & Transports, 350 pp. DAMAY L., forthcoming, “Un RER à Bruxelles ? Socio-histoire des rivalités et des régulations politiques”, Brussels Studies. http://brussels.revues.org (consulted on: 18 July 2013). DEHAIBE X. and LAINE B., 2010, Projections démographiques bruxelloises. Brussels : Ministère de la Région de Bruxelles-Capitale, Institut bruxellois de Statistiques et d’Analyse (IBSA). Les cahiers de l’IBSA, No. 1, 58 pp. DEMEY T., 1992, Bruxelles. Chronique d’une capitale en chantier. 2. De l’Expo ’58 au siège de la C.E.E, Brussels, Paul Legrain, CFC Editions, 329 pp. DE SOLERE R. (ed), 2012, La mobilité urbaine en France. Enseignements des années 2000‑2010, Lyon, Editions du Certu, Collection Références, 108 pp. DESSOUROUX C., 2008, Espaces partagés, espaces disputés. Bruxelles, une capitale et ses habitants, Brussels, Ministère de la Région de Bruxelles-Capitale, 149 pp. DIAZ O.L., MIGNOT D., PAULO C., 2004, “Daily mobility and inequality: the situation of the poor”, Built Environment, 30‑2, pp. 153‑160. DOBRUSZKES F., 2009, “Le projet de plan Iris 2”, Transports urbains, 116, pp. 15‑18. DOBRUSZKES F., FOURNEAU Y., 2007, Coût direct et géographie des ralentissements subis par les transports publics bruxellois, Brussels Studies, 7, pp. 1‑19. http://brussels.revues.org (consulted on: 18 July 2013). DOBRUSZKES F., HUBERT M., LAPORTE F., VEIDERS C., 2011, “Réorganisation d”un réseau de transport collectif urbain, ruptures de charge et mobilités éprouvantes à Bruxelles’, Articulo – Journal of Urban Research, online since 19 september 2011. URL: http://articulo.revues.org/1844#text, 7, pp. 1‑16. (consulted on: 18 July 2013). DUBOIS O., 2005, “Le rôle des politiques publiques dans l”éclatement urbain : l’exemple de la Belgique”, Développement durable et territoires [en ligne : http://developpementdurable.revues.org/747], Dossier 4, pp. 1‑17. (consulted on: 18 July 2013). ESPON, 2008, Territorial Dynamics in Europe. Trends in Population Development, 1, Luxemburg, ESPON 2013 Programme, Territorial Observation, 15 pp. FRENAY P., 2009, “Pour un projet de développement territorial associé au RER bruxellois. Essai de mise en évidence des facteurs déterminants fondamentaux”, Brussels Studies, 31, pp. 1‑18. http://brussels.revues.org (consulted on: 18 July 2013). GAUDIN J.-P., 1999, Gouverner par contrat. L’action publique en question, Paris, Presses de Sciences Po, 275 pp. GEERTS J.-F., HAEMERS V., STRATEC S.A., 2006, “Service reliability and transfer convenience on the Brussels tramway network”, AET European Transport Conference, Strasbourg, 16 pp. GOETHALS C., 2012, Les enjeux du financement des transports en commun à Bruxelles, Brussels, Les analyses du CRISP en ligne, 4 pp. GROUPE SNCB, 2013, Proposition de plan d’investissement 2013‑2025 v2.0, 61 pp. HUBERT M., 2008a, “L’Expo 58 et le ‘tout à l’automobile’. Quel avenir pour les grandes infrastructures routières urbaines ?”, Brussels Studies, 22, pp. 1‑17. http://brussels.revues.org (consulted on: 18 July 2013). HUBERT M., 2008b, “L’Expo ’58 et la mobilité quotidienne à Bruxelles : une influence décisive et durable ?”, in DELIGNE C., JAUMAIN S. (eds), L’expo ’58, un tournant dans l’histoire de Bruxelles, Brussels, Le Cri, pp. 115‑143. HUBERT M., 2009, “Planification et gouvernance : les écueils du projet de Plan Iris 2”, Transports Urbains, 116, pp. 19‑21. HUBERT M., DOBRUSZKES F., MACHARIS C., 2009, “La mobilité à, de, vers et autour de Bruxelles”, Brussels Studies, EGB 1, pp. 1‑15. http://brussels.revues.org (consulted on: 18 July 2013). INFRABEL, 2012, Rapport annuel 2011, 53 pp. KAUFMANN V., 2000, Mobilité quotidienne et dynamiques urbaines. La question du report modal, Lausanne, Presses polytechniques et universitaires romandes, Science, technique, société, 252 pp. KAUFMANN V., 2011, Rethinking the city. Urban dynamics and motility, Lausanne, EPFL Press (distributed by Routledge), 157 pp. KAUFMANN V., 2002a, “Temps et pratiques modales. Le plus court est-il le mieux ?”, Recherche Transports Sécurité, 75, pp. 131‑143. KAUFMANN V., 2002b, Re-thinking mobility : contemporary sociology, Transport and society, Aldershot, Hampshire, England ; Burlington, VT, Ashgate, 112 pp. LE GALÈS P., 1995, “Du gouvernement des villes à la gouvernance urbaine”, Revue française des sciences politiques, 45, 1, pp. 57‑95. LEBRUN K., DOBRUSZKES F., 2012, “Des nouvelles gares RER pour Bruxelles ? Enjeux, méthodes et contraintes”, Brussels Studies, 56, pp. 1‑18. http://brussels.revues.org (consulted on: 18 July 2013). LEBRUN K., HUBERT M., DOBRUSZKES F., HUYNEN P., 2012, L’offre de transport à Bruxelles, Brussels, Cahiers de l’Observatoire de la mobilité de la Région de Bruxelles-Capitale, No. 1, 91 pp. LEBRUN K., HUBERT M., HUYNEN P., De WITTE A., MACHARIS C., 2013, Les pratiques de déplacement à Bruxelles, Brussels, Cahiers de l’Observatoire de la mobilité de la Région de Bruxelles-Capitale, No. 2, 108 pp. LEBRUN L., CARTON V., HUBERT M. et al., 2009, Une nouvelle ambition pour les transports publics urbains et le développement de Bruxelles. La Cityvision ou comment faire beaucoup mieux que la Métrovision de la STIB avec moins de moyens, Brussels, 55 pp. LEWIS D., 2011, Economic Perspectives on Transport and Equality, International Transport Forum, OECD, Discussion Paper 2011‑09, 27 pp. MARESCHAL M., 2009, “Les contrats de gestion en Belgique, exemple d’une déjuridication”, communication au colloque de l’ULg “L’Etat doit-il être efficace ? Résultats escomptés et effets secondaires des nouveaux outils de la gestion publique”, 18 September 2009. MASI C., 2009, “Gouvernance urbaine, transport public et rôle des autorités organisatrices”, Transport Public International, 6, pp. 4‑6. MIGNOT D., 2004, “Mobilité et inégalités sociales”, in VODOZ L., PFISTER GIAUQUE B., JEMELIN C. (eds), Les territoires de la mobilité : l’aire du temps, Lausanne, Presses polytechniques et universitaires romandes, pp. 89‑104. MINISTERE DE LA REGION DE BRUXELLES-CAPITALE, 2012, Observatoire du commerce 2011, Brussels, Administration de l’aménagement du territoire et du logement, Direction études et planification, 73 pp. MISONNE D., HUBERT M., 2003, “Les communes bruxelloises et le problème de la mobilité : entre autonomie et convergence”, in WITTE E., ALLEN A., DUMONT H., VANDERNOOT P., DE GROOF R. (eds), Les communes bruxelloises et le modèle bruxellois, Brussels, Larcier, pp. 231‑253. MONNEAUX A., 2012, “Le modèle multimodal stratégique de déplacement”, Le Moniteur de la mobilité et de la sécurité routière, 36, pp. 6‑9. MONTULET B., HUBERT M., 2008, “Se déplacer avec des enfants à Bruxelles ? Une étude sociologique sur les vécus du temps et les usages des modes de transport”, Brussels Studies, 15, pp. 1‑15. http://brussels.revues.org (consulted on: 18 July 2013). NAHRATH S., VARONE F., 2007, “Les espaces fonctionnels comme changements d’échelles de l’action publique”, in FAURE A., LERESCHE J.-P., MULLER P., NAHRATH S. (eds), Action publique et changement d’échelles de l’action publique : les nouvelles focales du politique, Paris, L’Harmattan, pp. 235‑257. O’FALLON C., SULLIVAN C., HENSHER D., 2004, “Constraints affecting mode choices by morning car commuters”, Transport Policy, 11 (1), pp. 17‑29. O’FARREL P., MARKHAM J., 1974, “Commuter perception of public transport work journey”, Environment and Planning, 6, pp. 79‑100. OHNMACHT T., MAKSIM H., BERGMAN M.M. (eds), 2009, Mobility and Inequality, Farnham, Ashgate, 238 pp. ORFEUIL J.-P., 2011, Dix ans de “droit à la mobilité”, et maintenant ?, Métropolitiques, http://www.metropolitiques.eu/Dix-ans-de-droit-a-la-mobilite-et.html (consulted on: 18 July 2013). PARLEMENT DE LA REGION DE BRUXELLES-CAPITALE, 2011, Compte rendu intégral des interpellations et des questions orales. Réunion du mercredi 12 octobre 2011, Brussels, 22 pp. POLASKY J.L., 2010, Reforming urban labor: routes to the city, roots in the country, Ithaca, N.Y., Cornell University Press, XII, 238 pp. PURWANTO A.J., 2003, “Measuring Inequality in Mobility: a Capability Perspective”, 3rd Conference on the Capability Approach, University of Pavia, Pavia. RÉGION DE BRUXELLES-CAPITALE, 2011, IRIS 2. Plan de mobilité de la Région de Bruxelles-Capitale, Brussels, Bruxelles Mobilité-AED de la Région de Bruxelles-Capitale, 146 pp. RÉGION DE BRUXELLES-CAPITALE, 2012, Position de la RBC par rapport aux enjeux en matière de développement de l’offre et de l’infrastructure ferroviaire, note aux membres du Gouvernement de la Région de Bruxelles-Capitale, 9 pp. SOCIÉTÉ DES TRANSPORTS INTERCOMMUNAUX DE BRUXELLES (STIB), RÉGION DE BRUXELLES-CAPITALE (RBC), 2013, Contrat de gestion entre la Région de Bruxelles-Capitale et la Société des transports intercommunaux de Bruxelles. 2013‑2017, Brussels, 105 pp. STIB, 2009, Métrovision. Passé-présent-futur, Brussels, 248 pp. STIB, 2011, Rapport quinquennal sur l’exécution du contrat de gestion 2007‑2011 liant la Région de Bruxelles-Capitale et la Société des Transports Intercommunaux de Bruxelles, Rapport final, Brussels, 120 pp. STIB and BRUXELLES MOBILITÉ, 2010, La “Cityvision”, une vision tronquée, Brussels, 16 pp. TELLIER C., 2010, “Des controverses aux compromis. Les lignes de front du métro bruxellois”, Belgeo, 1‑2, pp. 211‑228. TELLIER C., 2012, Corps technique et techniques du corps. Sociologie des ingénieurs du souterrain bruxellois (1950‑2010), Brussels, Dissertation présentée en vue de l’obtention du titre de Docteur en sciences sociales et politiques, ULB, 523 pp. TERRIN J.-J. (ed), 2011, Le piéton dans la ville. L’espace public partagé. Walking in the city. Sharing public space, Paris, Parenthèses, 277 pp. UITP, 2009, Intégration des transports publics et de l’urbanisme : un cercle vertueux, Brussels, Focus, prise de position de l’UITP, 6 pp. URRY J., 2007, Mobilities, Cambridge, Polity Press, 335 pp. VAN WYNSBERGHE C., 2013, “Bruxelles et Washington : deux capitales fédérales enclavées, deux expériences métropolitaines comparables ?”, Brussels Studies, 66, pp. 1‑11. http://brussels.revues.org (consulted on: 18 July 2013). VERWILGHEN G., 2012, “Pulsar, le métro de l’avenir”, Le Moniteur de la mobilité et de la sécurité routière, 36, pp. 10‑12. WUNDERLE M., 2011, Quelle communauté urbaine pour Bruxelles ? Réflexions sur la ‘communauté métropolitaire’ prévue dans l’accord de gouvernement de 2011, Les analyses du CRISP en ligne, 7 pp. Ye X., PENDYALA R., GOTTARDI G., 2007, “An exploration of the relationship between modal choice and complexity of trip chaining patterns”, Transportation Research Part B: Methodological, 41 (1), pp. 96‑113. ZITOUNI B., TELLIER C., 2013, “Comment les corps techniques construisent la ville. Gestion stratégique du temps lors de la conception du plan d’extension urbaine au 19e siècle et de la création du (pré-)métro au 20e siècle à Bruxelles”, Brussels Studies, 64, pp. 1‑17. http://brussels.revues.org (consulted on: 18 July 2013). 1 In alphabetical order: Philippe Barette (Bruxelles Mobilité), Gaston Bastin (Bruxelles Environnement), Alain Broes (Bruxelles Mobilité), Eric Cooremans (Bruxelles Mobilité), Juliette De Villers (Bruxelles Environnement), Astrid De Witte (VUB-MOSI-T), Frédéric Dobruszkes (ULB-IGEAT), Valérie Haemers (STIB), Pierre Lannoy (ULB), Nathalie Lhomme (Bruxelles Mobilité), Annabel Monneaux (Bruxelles Mobilité), Marie Poupé (Bruxelles Environnement), Thierry Richel (Bruxelles Mobilité), Chantal Roland (Bruxelles Mobilité), Astrid Romain (IBSA), Marianne Squilbin (Bruxelles Environnement), Christel Straetemans (Cabinet Grouwels), Valérie Tanghe (Port de Bruxelles), Marianne Thys (Bruxelles Mobilité), Yves van de Casteele (AATL), Arnaud Verstraete (Cabinet De Lille) and Fabien Walle (Bruxelles Mobilité). 3 See in particular issue 114 (November 2008) of the journal Transports urbains dedicated to “Bruxelles : entre blocages, défis et espoir” and the title of the conclusion by F. Dobruszkes: “Une capitale européenne peut-elle être mauvaise élève ?”. 5 This phenomenon is not specific to Brussels. It is seen in 85% of the urban regions in Europe and in most capital cities [ESPON, 2008: 13]. 6 Of all travel “in connection” with BCR (on an average day), two thirds are “internal” (i.e. they have an origin and a destination within BCR) and one third is “inbound” or “outbound” [Lebrun et al., 2013: 9]. 8 The term “travel” used here and throughout the rest of the text, means a one-way journey for any reason using a public infrastructure between an origin and a destination. Travel may take place using several modes of transport. 9 i.e. by not distinguishing between a working day during the school year and a working day outside the school year. 10 These figures from the Direction stratégie of Bruxelles Mobilité, are the result of an extrapolation based on data from the BELDAM survey (2010) and the MOBEL survey (1999). They are based on a certain number of hypotheses, given the likelihood of an underestimate of the rate of mobility and the average number of journeys in the BELDAM survey [Cornelis et al., 2012: 17‑24]. 11 Thus, the average number of journeys per day and per person within major urban areas in France recently went from 3.69 (1995‑2004 period) to 3.62 (2005‑2009 period), i.e. a stabilisation following a long period of increase (3.19 for the 1975‑1984 period) [De Solere, 2012: 17]. 13 The inequalities of access have been the subject of many academic works in various contexts [Diaz et al., 2004; Kaufmann et al., 2007; Lewis, 2011; Mignot, 2004; Ohnmacht et al., 2009; Purwanto, 2003]. 14 This being said, we are not forgetting that part of the urban exodus is due to the high cost of real estate in Brussels and that certain parts of the RER area also reach populations with lower income who might benefit from better public transport services. 16 See, for example, www.keyzee.be. The use of carpooling services (such as www.carpool.be or www.karzoo.be) also has the advantage of not having to worry about dropping off a vehicle. 18 This knowledge comes mainly from card validation (MOBIB) (but we only have information regarding the start and not the end of all journeys) and studies related to different mobility/urbanism projects. To this are added occasional counts which do not cover the entire network efficiently for all temporalities. 21 Other factors may reinforce this phenomenon such as, for example, the availability of a company car. 22 “Mobility” only became a competence at all levels of authority at the turn of the 21st century [Misonne and Hubert, 2003], probably under pressure from the “mobility turn” mentioned in the introduction. 23 For Brussels, in 1971 the Road Administration gave the Intercommunale B1 the task of implementing its ambitious development plan (ring, entry motorways, etc) [Demey, 1992]. 24 It is important to point out that this competence is among those which potentially involve “federal supervision in view of preserving the international role of Brussels and its function as a capital” (article 45 (administrative supervision regarding suspension and annulment)/art. 46 (administrative supervision regarding substitution)) of the special law of 12 January 1989 on Brussels’ institutions). There are no precedents to this day, probably because the requirements for the supervision are implicitly integrated into the choices of the Brussels Region. 25 It will not be until the Regional Sustainable Development Plan (PRDD) – which is currently being debated (2013) – that the necessary link between transport policy and urban development will be mentioned clearly [UITP, 2009]. 26 STIB was created on 1 January 1954 as a company governed by public law associating the Belgian state, the Province of Brabant, 21 municipalities of Brussels and the former public limited company “Les tramways bruxellois”. 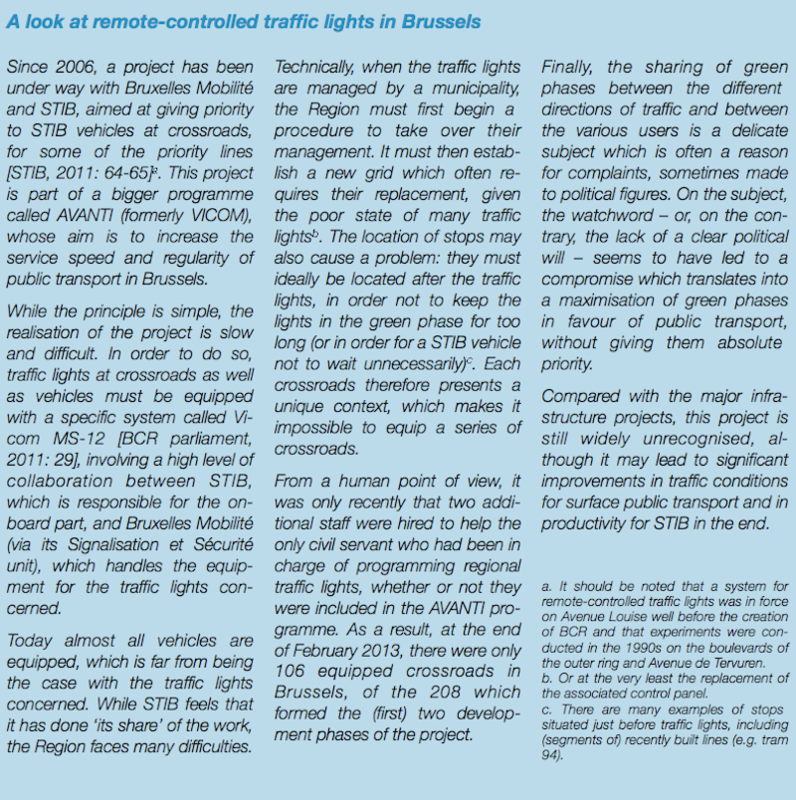 On the history of STIB, see in particular the official website www.stib.be (tab: history) and its fact sheet entitled “Petite Histoire du transport public à Bruxelles”. 27 Order of 22 November 1990 related to the organisation of public transport in the Brussels-Capital Region, art. 1 to 3. The first management contract was signed on 19 March 1991 and the last – the fifth – on 13 March 2013 for the 2013‑2017 period. 29 Order of 22 January 2009 “relating to the organisation of the parking policy and the creation of the Agence du stationnement de la Région de Bruxelles-Capitale”. 30 More precisely, the company which develops Cambio in the Brussels Region is called “Optimobil Brussels S.A.”. It is a private company of which STIB – a company governed by public law – owns a share of the capital. 31 The contract is currently being renewed for a new period of 5 years. Let us also specify that the company TRB does not play the role of taxi operator but has a call centre as well as a dispatching centre which allows it to assign the journeys to its members who are independent taxi operators recognised by BCR. 32 It is surprising to see that in the STIB organisation chart (from 16/1/2012, accessible at www.stib.be), the SSE is still mentioned in connection with the head office and without its “new” name. 33 The last management contract specifies in article 11 that “STIB is authorised to make proposals to the Region regarding the regional mobility strategy for aspects concerning urban public transport and intermodality”. 34 According to the “Agreement in principle between the Flemish Region and BCR organising cooperation regarding shared mobility problems” of 1998, the financing of urban and regional cross-border lines is based on the principle of territoriality, which means that the infrastructure costs (financing, development and renewal) are the responsibility of the Region where the infrastructure is set up. The operator in the other Region must however pay a usage fee (negotiated). 36 A cooperation agreement between the Regions must still specify the object and operational procedures, and an appeal before the constitutional court has already been made by certain Flemish municipalities which refuse their status of “full members”. 37 The opinion of the Council of State 51218/AG of 2 May 2012 underlines the obligation to sign a cooperation agreement, but not that of consulting later. Furthermore, the “metropolitan community” is a coordination authority and not a decision-making authority. 39 Beliris is at its 11th contract for an amount of 566 million euros over three years (2012‑14), close to 200 million of which are for STIB (rolling stock, renovation of the Central Station, creation of the tram line 9) and for road developments (Cortenbergh tunnel which must be extended under Schuman roundabout, studies for a tunnel under Place Meiser and for the burying of the Botanique and Toison d’or tunnel approaches, the development of squares and streets, the construction of the Picard footbridge, etc). 40 The last to date was approved on 19 June 2013 by the ad hoc consultation committee against the opinion of the municipality of Ixelles. 41 By virtue of the references made on p. 4 to the RDP which, in its “environment” section, recommended a 20% decrease in the overall volume of traffic (vehicles/km) by 2010 with respect to the 1999 reference year. 42 In the present parliamentary term, the competence regarding mobility is shared between Minister Brigitte Grouwels (CD&V) and Secretary of State De Lille (Groen!). The latter is in charge of planning and studies. 43 This new norm of 3 passengers per m2 appears on page 69 of the Iris 2 Plan but curiously returned to 4 passengers in the new management contract (article 16). 44 The Brussels Government took the decision in principle in March 2013, to join this underground tramway tunnel to a road tunnel as seen in certain works from the 1960s, 1970s and 1980s. 45 We are not considering means which the Region devotes to itself (administrations and ministerial cabinets) to design and implement its mobility policy in general, and its public transport policy in particular. 46 This standard is stricter than STIB’s traditional accounting as it excludes from the company’s own revenue the amounts received (58.5 million in 2013 and 2014) in compensation for the social fares imposed by the Region. According to this standard, the rate of coverage was therefore only 46% in 2012 whereas it was 54% according to STIB’s accounting (3.5 point lower with respect to 2010). 47 The management contract (art. 73) mentions ’possible regional income related to the implementation of a fare per kilometre’ without providing any figures. 49 More than just a sharing of public space between all users, this reference reverses the hierarchical organisation established in the 20th century with the advent of the car. It is what the Flemish Belgians refer to as the “STOP” principle, which organises urban development by giving priority to the following modes, in the following order: “Stappen, Trappen, Openbaar vervoer, Private wagen” (walking, cycling, public transport, private car). In other words, if there is no longer any room for cars in a given public space, they must be removed, just as pedestrians were kept away from motorways. 51 The project does not provide for the fresh construction of new railway lines but rather their splitting where this is deemed necessary. The Schuman-Josaphat tunnel is the only exception. 53 A crossing of modal shares with the place of residence shows the weakness of the train for internal traffic in the Region, including for those who are more in the habit of using it (Walloons and Flemish). 54 This project involves a collaboration between the federal state, the three Regions and the four main transport operators. 55 BCR currently has 31 stations and stops, but apart from the main ones, the service is rather basic with low frequencies (usually just one train per hour in each direction and per connection). The creation of additional stops has been requested by BCR (see Lebrun and Dobruszkes, 2012). 56 “The plan was established based on the hypothesis of the continuity of principles applied until now for the regional distribution of investments, in particular the compliance with a distribution key for investments in these two Regions of 60% in the Flemish Region and 40% in the Walloon Region” [SNCB 2013, 46]. The investments in BCR are therefore not concerned, but most of the works related to the RER take place in the territory of the two other Regions. 57 Slow decision-making process, lack of qualified staff at Infrabel/TUC Rail and the appeals lodged by citizens as well as by certain municipalities. 58 A distinction must be made between the infrastructure, managed by the public limited company Infrabel, and SNCB-voyageurs, a company governed by public law, which is the railway operator. These two companies are overseen by SNCB Holding, which is supervised by the federal state. In this case, it is not always possible to know the positions of each of the entities, or the tensions which may occur. 59 Cahier No.°3 of the BCR Observatoire de la mobilité, forthcoming in 2014, will focus on this question in particular. 60 The objective of interoperability is the compatibility of transport services in spatial, temporal, ticketing, etc terms.